Rescued from Spreadsheet Overload: A Winning Case Study - MT Works, LLC. When a leading managed healthcare provider needed relief from their spreadsheet overload they turned to MT Works for help. Our client had been dependent on custom spreadsheets for management and financial reporting of their projects, which was making it almost impossible to determine the true cost and ROI of their projects. 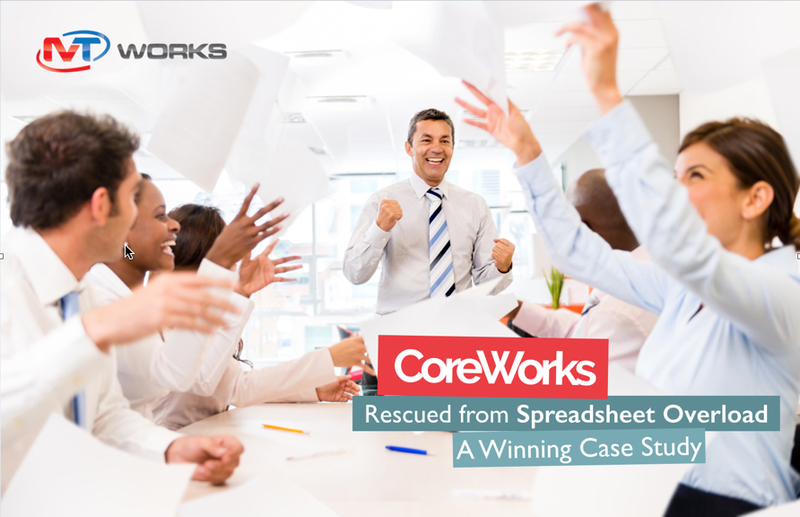 The CoreWorks solution we provided eliminated the need for individual spreadsheets by integrating data from multiple enterprise data sources into our consolidated data warehouse. Our solution standardized project management via a user-facing, intranet based reporting and management dashboard system. At MT Works, our consulting team combines years of industry, technology, and business process knowledge to drive productivity gains and to achieve a competitive advantage for our customers. We understand before implementing any technology solution, we must first understand your unique business processes. Our CoreWorks Business Solutions allow you to easily manage your business from one place, anywhere. We give organizations full visibility into a single source of accurate information so that they can quickly react to changing business needs. Contact us today and schedule a quick call to learn more about MT Works.